Viewpoint: Could Ted Cruz Have Gotten This Far Without His Wife Heidi? On November 4-5, 2015, about a year out from the 2016 presidential election, things looked good for Ben Carson. He overtook Donald Trump at the top of the stacked GOP primary field at 24.8% of the Republican vote and posted solid fundraising numbers. For the retired Seventh-day Adventist neurosurgeon, his presidential bid couldn’t have been going better. Meanwhile, Texas senator Ted Cruz, whose wife Heidi Nelson Cruz is the other Republican with Adventist ties* hoping for a Pennsylvania Avenue mailing address in 2016, sat in fourth place among GOP hopefuls, polling at about 8.8%. Today, the situation for the two candidates is nearly reversed. Ted Cruz has climbed steadily into second place behind Trump, and Ben Carson has fallen to 4th, polling at 8.8% according to a Real Clear Politics average, nearly his lowest numbers since August 17, 2015. As Ted Cruz’s poll numbers have increased, so has the scrutiny that accompanies a rising presidential candidate. Among the subjects of scrutiny, Cruz’s citizenship (Cruz was born in Canada to an American mother), and his failure to disclose loans from Goldman Sachs and Citibank to the Federal Election Commission during his successful 2012 Senate campaign. Heidi Cruz, the daughter of Seventh-day Adventist missionaries and Harvard Business School graduate, is a managing director at Goldman Sachs, on leave during her husband’s presidential campaign. Catherine Frazier, a spokesperson for the Cruz campaign, said that failing to report the Goldman Sachs loan, for as much as $500,000, was “inadvertent.” She also said that the campaign would file corrected reports as needed, and that Cruz had not attempted to hide anything. The truth is that Ted Cruz probably would not have made it to this point without the help of Wall Street and his wife’s place in it. Therein lies the irony, one not lost on Republican rival Rand Paul, who just released a bizarre campaign ad, "Audit The Ted," criticizing Cruz’s Wall street ties. Also ironic: The New York Times has reported on Heidi Cruz’s love of “The Apprentice,” the TV show that helped make Donald Trump a celebrity. 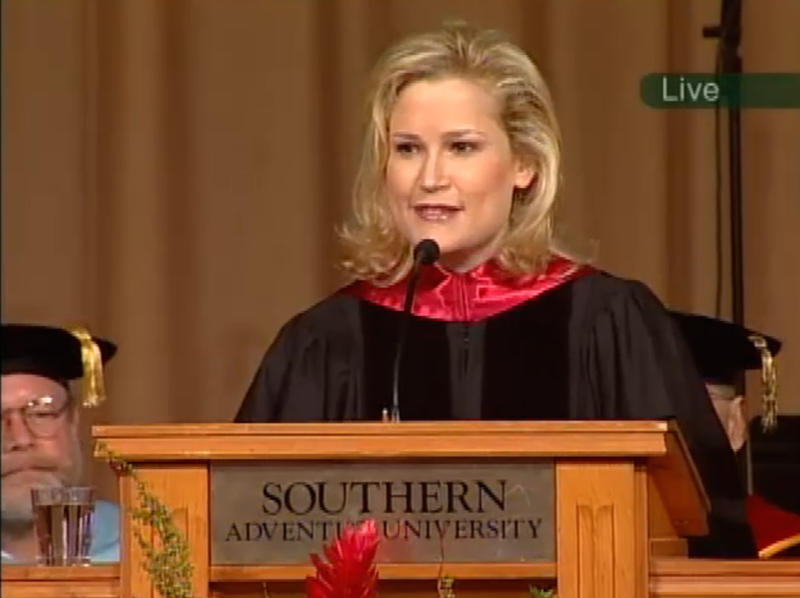 Mrs. Cruz talked up the show during her 2004 Southern Adventist University commencement address (one last odd coincidence: Ben Carson was Southern’s 2005 commencement speaker). Ironies aside, Heidi Cruz has been and continues to be instrumental to her husband’s political aspirations. Her career on hold, she has been phone banking and traveling extensively in service of Ted Cruz’s campaign. *While Heidi Cruz was raised in a Seventh-day Adventist household, she now identifies with the Baptist faith of her husband Ted Cruz. An earlier version of this article misidentified Heidi Cruz as an Adventist.